PVC schedule 80 electrical conduit pipe is used to protect electrical wires from the elements. When the wires have to make a turn, the PVC pipe protecting them must be bent to the right or left. Bending PVC pipe properly comes with practice. To bend or manipulate schedule 80 PVC pipe, it must be heated. To get started, you need a PVC heater and an electrical source. Plug in the PVC heater. Make sure you are in a well- ventilated area. Allow the heater to heat up until the elements inside turn red. Flip open the top so the heater doesn't get too hot to handle. Place the schedule 80 PVC pipe in the heater, centered at the point where you want to make the bend. Allow one side to heat up for about five minutes, or until the pipe begins to smell. It will smell like plastic but it will not be burned. PVC pipe should be heated at 225 to 275 degrees "for the minimum amount of time necessary to achieve uniform softening," according to the Harvel Plastics website. Put on welder's gloves -- the PVC pipe can become extremely hot and will burn you if you are not careful. Rotate the pipe in the heater to the opposite side, using your gloved hands. Let it heat up for the same amount of time, checking constantly without opening the heater. Remove the pipe from the heater carefully. 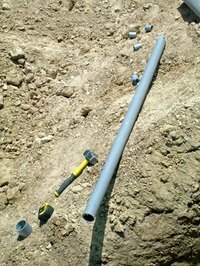 Lay the pipe in your conduit trench, forming the pipe as you lay it. If the pipe cools off before you get it positioned, take the hand blow dryer and continue heating the pipe until you form it correctly. Allow the pipe to completely cool before you attach any other pipe to it.